Cooking Mexican black beans is easily done in the pressure cooker. The result is a ridiculously tasty and creamy bowl of perfectly cooked beans. 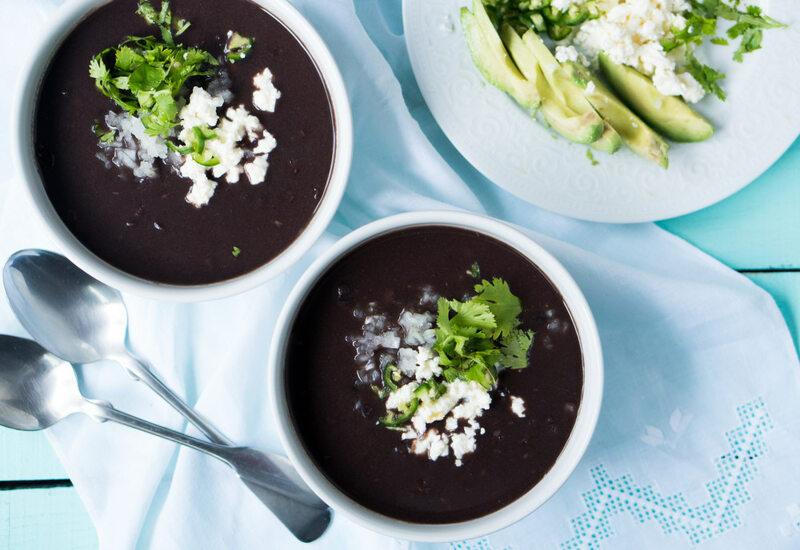 This preparation of Mexican black beans is vegetarian and vegan, as well as gluten-free and dairy-free. Black beans are packed with fiber and protein, which means they will help keep you feeling full and give you energy for hours. Serve right away with toppings of choice or store refrigerated for up to 4 days. Also note that beans freeze very well. Use these beans for refried beans! Drain them well, mash them up and fry for 10 to 15 minutes with olive oil (or traditionally with lard). Black beans are classified as legumes. They are also known as "turtle beans" because of their shell-like appearance. Per Serving: 259 calories; 1g fat; 47.5g carbohydrates; 16g protein; 0mg cholesterol; 306mg sodium. perfect, simple black beans. i love making beans in my pressure cooker and am always looking for the best recipes to make perfect, soft, but not overcooked beans. this is a great one. I love black beans and I really enjoyed them in this quick and easy pressure cooker recipe. I couldn't figure out what was missing with all the other recipes I've tried, and it's the onion! Adds so much flavor to this side dish. I added in a little cilantro but was so happy with the recipe and that the right amount of time was given. I've definitely over/undercooked black beans before. Used as a side for taco night! Love that this can be done so quickly in a pressure cooker! These are so good! Made these for the third time tonight and they have been delish every time. I plan to add some garlic next time. Really easy and fulfilling dish. I added in some diced chicken and topped with diced red onions and cotija cheese. This recipe turned out the best black beans I’ve ever had; if I got these at a restaurant I’d go back for more. Yummm Truly five star and easy too. I love freshly cooked black beans. I also like to add some Epazote leaves to it. Super easy to make and what a time saver. I usually soak my beans overnight and then cook them in the slow cooker all day. I was short on time today, so looked up how to make beans quickly. So glad I found this recipe and that I have a Mealthy Multipot so I can pressure cook everything!